(Kitco News) - Illegal gold mining is by no means a new phenomenon, but it has been getting more and more attention with gold’s decade-long bull run. In the past, the focus on illegal gold mining has been more about the money countries are losing, but the spotlight is now starting to shift to the impact of these illegal practices on the environment. At the moment, the Amazon rainforest, Earth’s largest rainforest, is seeing a growing number of illegal miners operating within it, causing environmental damage and disrupting Indigenous tribes living on government protected land. In a joint statement to Kitco News, Marco W. Lentini, head of the Amazon program of WWF-Brazil, and Jean Timmers, superintendent of public policy at WWF-Brazil, said the region between the Amapá state in Brazil and French Guiana is one area that is experiencing major problems. “Illegal mining has intensified land use conflicts and also give incentives to encroach and access remote areas within protected areas in the Amazon, frequently with great conflicts with indigenous and other traditional populations,” they said. Brazil boasts roughly 60% of the Amazon rainforest within its borders, with Colombia and Peru making up 10% and 13% respectively. The rest is shared between Bolivia, Ecuador, Guyana, Suriname and Venezuela. Towards the northern part of Brazil, at the border it shares with Venezuela, illegal gold miners have disrupted the protected land of the indigenous Yanomami tribe. This is not a new development for the Yanomami, as the issue peaked in the late 80’s and early 90’s after illegal gold miners destroyed Yanomami land, effectively killing off a large portion of the tribe due to malaria, mercury poisoning and outright violence. 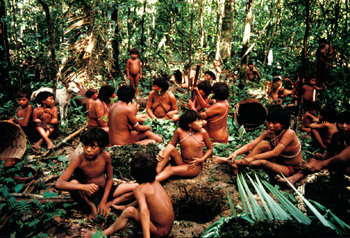 An international campaign was eventually launched to help protect the tribe and their indigenous area and the issue was suppressed somewhat. “That helped hugely, as it meant on paper the land was for the exclusive use of the indigenous people and that was something prescribed by the constitution and international law,” Sarah Shenker, a campaigner with Survival International, a non-governmental international organization specializing in indigenous rights, told Kitco News. However, illegal gold miners have continued to operate in the area and there’s been an uptick of late, with the effects being felt by the local indigenous people. “The Yanomami are saying their rivers are being contaminated and their fish are dying from the mercury contamination,” Shenker said. “They’ve also noticed an increase of Malaria in areas where the illegal miners are operating. Combating illegal gold mining in the Amazon is a difficult task, as the dense rainforest renders satellite imaging nearly obsolete. Illegal gold miners also try and operate in secrecy, meaning it’s likely they’re not deforesting in abundance in order to retain cover. Both groups say the Brazilian government is not doing enough to discourage and eliminate illegal gold mining in the Amazon. While some laws have been put in place, they’re seen as incomplete or simply not enforced to their full extent. “The Brazilian Government needs to ratify an agreement with France allowing the two countries to fight against illegal gold mining in a 150 kilometer strip along the two sides of the border between French Guiana and the Amapá state,” WWF said. “The pact was approved by the National Congress in the end of 2013, but until now the ratification is not complete. 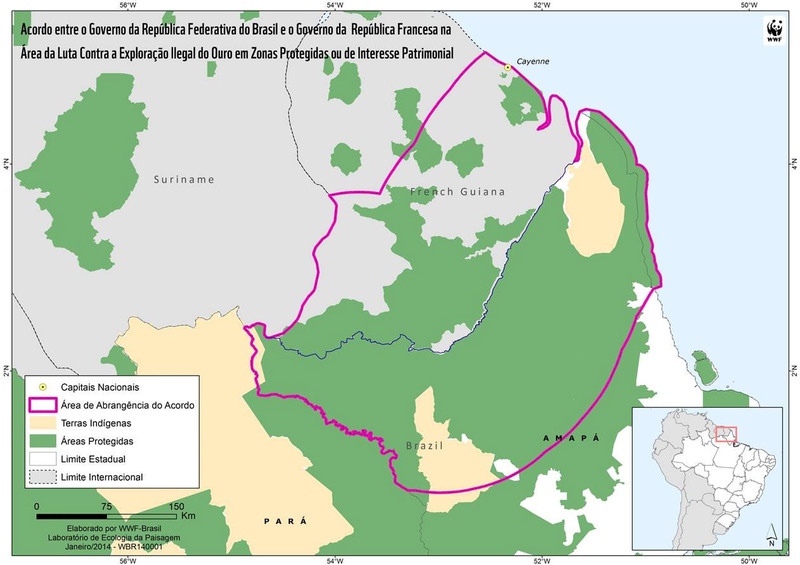 Highlighted in purple is the area which an agreement was reached between the Brazilian government and France. In green are protected lands and indigenous lands in yellow. For the Yanomami on the Venezuelan and Brazilian border, the Brazilian government has implemented some initiatives to combat illegal mining, most recently ‘Operation Korekore’ which lasted 30 days, but Shenker said more is needed. Tension has been mounting with recent reports stating Davi Kopenawa, a well known spokesperson of the Yanomami, has been receiving death threats from illegal gold miners. 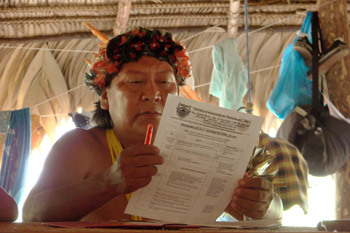 Both organizations believe the solutions to preserving the Amazon and its indigenous tribes are straightforward. “First of all, it is imperative that illegal mining is banned from protected areas,” WWF said. “Social losses in this field can be counter-balanced by projects aiming to structure the forest positive agendas in inland regions. “Outside protected areas, mining can be done, but there needs more investment in technologies to reduce pollution (the use of mercury is a good example) and to offer minimal standards in terms of safety and working health conditions,” they said. Specifically for the Yanomami, Shenker believes “larger government operations, larger than what we’ve already seen, that encompasses the whole territory, on the Venezuelan side as well” are needed. The Brazilian Ministry of Mines and Energy did not immediately reply to interview requests.